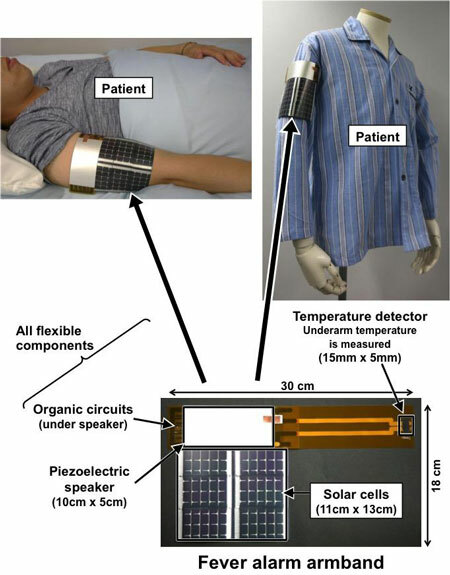 (Nanowerk News) University of Tokyo researchers have developed a "fever alarm armband," a flexible, self-powered wearable device that sounds an alarm in case of high body temperature. This armband will be presented at the 2015 IEEE International Solid State Circuits Conference, San Francisco, on 22-26 February, 2015. The flexible organic components developed for this device are well-suited to wearable devices that continuously monitor vital signs including temperature and heart rate for applications in healthcare settings. The new device developed by research groups lead by Professor Takayasu Sakurai at the Institute of Industrial Science and Professor Takao Someya at the Graduate School of Engineering combines a flexible amorphous silicon solar panel, piezoelectric speaker, temperature sensor, and power supply circuit created with organic components in a single flexible, wearable package. Constant monitoring of health indicators such as heart rate and body temperature is the focus of intense interest in the fields of infant, elderly and patient care. Sensors for such applications need to be flexible and wireless for patient comfort, maintenance-free and not requiring external energy supply, and cheap enough to permit disposable use to ensure hygiene. Conventional sensors based on rigid components are unable to meet these requirements, so the researchers have developed a flexible solution that incorporates organic components that can be printed by an inkjet printer on a polymeric film. The fever alarm armband incorporates several first-ever achievements. It is the first organic circuit able to produce a sound output, and the first to incorporate an organic power supply circuit. The former enables the device to provide audible information when the flexible thermal sensor detects a pre-set value within the ranges of 36.5 ºC to 38.5 ºC, while the latter increases the range of operational illumination by 7.3 times in indoor lighting conditions. "Our fever alarm armband demonstrates that it is possible to produce flexible, disposable devices that can greatly enhance the amount of information available to carers in healthcare settings," says Professor Someya. "We have demonstrated the technology with a temperature sensor and fever alarm, but the system could also be adapted to provide audible feedback on body temperature, or combined with other sensors to register wetness, pressure or heart rate."